August 24, 2010 - Nextant Aerospace announced they have begun the full power ground runs stage of the Williams International FJ44-3AP certification process. The installation of the Williams FJ44-3APs engines is the final phase of the 400XT product which breathes new life into the Beechjet 400A/XP. The engine certification is progressing on schedule with the first flight taking place shortly. ?I was thrilled to be able to pilot the aircraft during the first full power ground run? said Kenn Ricci, Chief Executive Officer Nextant Aerospace. ?I immediately noticed the significant improvement the Williams engines offer over the Pratt 15D engines. The FJ44-3AP engines idled at much lower power and were more responsive and exact when you asked for power. With the 3AP engines being Stage 4 compliant the noise level in the cabin is significantly quieter.? Nextant 400XT 1st Engine Start. The Nextant 400XT is a remanufactured Beechjet 400A/XP equipped with the FJ44-3AP engines and Rockwell Collins Pro Line 21 fully integrated avionics. The 400XT is delivered with zero timed inspections, Life Limited Components, ADs and Mandatory SBs compliance, and a 2 year tip to tail warranty. Nextant Aerospace was formed for the primary purpose of developing an aircraft modernization program. In 2007, Nextant launched their first aircraft retrofit program the 400XT. 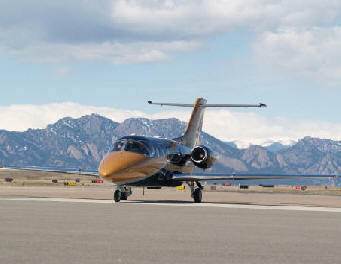 The 400XT includes three major upgrades to the Beechjet 400A/XP. These include upgrading the flight deck with a Rockwell Collins Pro Line 21? avionics suite, replacing the P&W JT15D engines with Williams FJ44-3AP engines, and aerodynamic enhancements including nacelles, pylons and an improved engine mounting configuration. Nextant?s Service Center Network consists of two maintenance and overhaul facilities at Cleveland Hopkins International Airport (CLE) and Birmingham International Airport (BHM) and a design and manufacturing facility located at Cuyahoga County Airport (CGF). Williams International is the world leader in small turbine engines and customer support, with headquarters in Walled Lake, Michigan, and a design-to-production facility in Ogden, Utah.